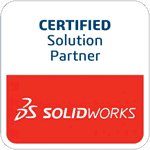 Springville, CA, October 12, 2010 – TEDCF Publishing, a SolidWorks Solution Partner and producer of multi-media training courses, announced the availability of their SolidWorks 2010: Mechanical Drawings course. The newest addition to the TEDCF Publishing family of courses teaches the SolidWorks 2D commands. David Melvin, PE, the author of the course, also demonstrates the techniques required to create professional 2D drawings. The 2010 course release features a new control panel. Users can view the lessons in full-screen, adjust the playback speed, and skip through or rewind each lesson by clicking the slider. Learn more about the new SolidWorks: Mechanical Drawings 2010 course.